The High Court picks up after the events of the previous book, with Hyperion and Kronos being tried for their crimes. What were some themes you wanted to carry over from book one and what were some new ideas you wanted to explore? I definitely wanted to carry over themes of parenting, or lack thereof. So much of mythology is deities behaving badly. and in Kronos we have the ultimate crappy parent. And how. But I also wanted to contrast that style of parenting with Rhea’s more maternal side. But other parent/ child relationships arise as well. Additionally, I wanted to carry forward this idea of duality and that nothing is ever as simple as it appears to be initially. I wanted to confuse the readers’ loyalties a bit in that regard. New ideas I wanted pursue were the ideas of justice and what that meant. And retribution versus restraint. A race of giants attack the students and force them to flee while the giants grow stronger with every attack. What was the inspiration for this race of giants? In Greek mythology, there actually was a Gigantomachy, or war between gods and giants. Chronologically, it occurred after the Olympians-Titans war (Titanomachy). I wanted to sneak a representation of it into book 2 seeing as though to many readers a war between gods and giants might have been anti-climactic after all the egos and storylines of the Titanomachy. Zeus continues to be an intriguing character with multiple layers. What were some driving ideals behind his character development? Firstly, thank you for that. I’m happy that he came out so well in your eyes. One thing I was very cognizant about was the perception of Zeus, the classic king of the pantheon. He doesn’t have the best reputation. Haha. I wanted to build a view toward more humble beginnings for him and show the natural teen angst, uncertainty, and discomfort with coming of age. Where will book three in the Sky Throne series take readers and when will it be available? High atop Mount Olympus, as dawn breaks on a new academic term, normalcy returns to campus following a harrowing expedition into The Underworld to rescue kidnapped students. Zeus and his fellow Olympians now prepare to testify in The High Court where Hyperion will be tried for the attack on Crete and death of Anytos and Kronos will stand trial for the murder of MO Prep’s Headmaster Ouranos. As the trial draws near, the MO Prep students and faculty are besieged repeatedly by a race of gargantuan stone and earth giants. Under heavy assault, the Olympians are forced to flee to the volcanic island of Limnos to regroup. Meanwhile, a toxic poison Zeus has carried with him since a prior fight with a dragoness creeps toward his brain. 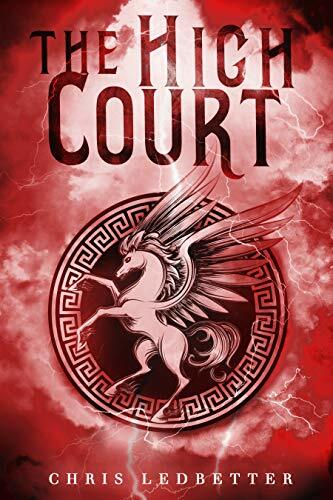 In a race against time and beasts, Zeus and his friends must find a way to survive not only the toxin ravaging Zeus’ body, but also the giants who grow stronger after every attack, and somehow make it to the The High Court alive.